[prMac.com] Hagenberg, Austria - Ergonis Software today is thrilled to announce the release of Typinator 5.3, an improved new version of their popular text expander. The new version allows to insert special navigation keys in text expansions and can so fill out an entire form with just one snippet. In Typinator 5.3, you can enrich snippets with markers that represent special keys on the physical keyboard. For example, you can insert a tab marker in the middle of an expansion to simulate a tab keystroke at this point. This allows you to jump from field to field in web forms and other dialog windows, so you can fill out an entire form with just one snippet. Other supported keys are the return key, the enter key, cursor keys, and more. The new version also contains many further enhancements including faster clipboard-based expansions, improved speed of cursor positioning within multi-line expansions, and improved insertion of formatted text in certain applications. It also offers improved compatibility with OS X 10.8 (Mountain Lion) and third-party applications like AccountEdge Pro, Fluid, Sublime Text 2, Quicken Essentials, and Mail. Typinator 5.3 requires Mac OS X 10.5.8 or newer and is fully compatible with OS X 10.8 (Mountain Lion). Typinator can be purchased securely on the Ergonis Software website. 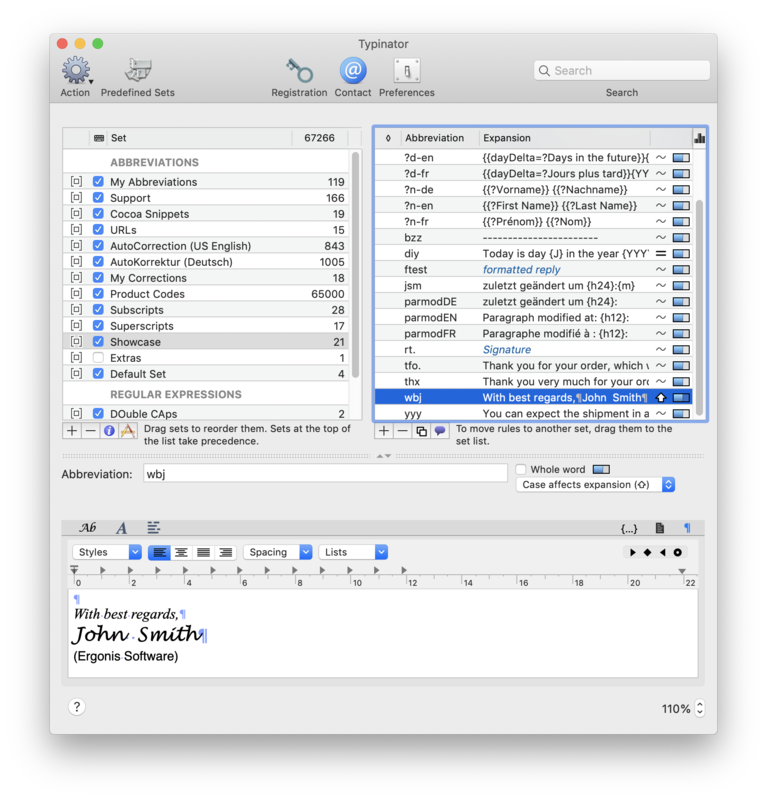 The upgrade to Typinator 5.3 is free for anyone who owns a valid license for Typinator 5. Visit Ergonis Software's website to learn more about the changes in this release and to download and try the new version. Upgrade paths are available for owners of older licenses. See the company's web site for information about purchases, including enterprise licenses, volume discounts, and upgrade pricing offers. Instead of purchasing Typinator by itself, customers can get the Ergonis Productivity Bundle that also contains two of the company's other productivity tools, PopChar X and KeyCue. Headquartered in Hagenberg, Austria, Ergonis Software Gmbh is a privately held software development company founded in 2002. With a focus on innovation, Ergonis develops ergonomic and intuitive software that boosts the productivity of Mac and PC users alike. Copyright 2002-2012 Ergonis Software Gmbh. All Rights Reserved. Ergonis products are either registered trademarks or trademarks of Ergonis Software GmbH. Other company and product names may be trademarks of their respective owners.